This product is featured in: A close look at the Beretta 686 Silver Pigeon 1. Mechanically speaking, this new Beretta Sporter is identical to other guns in the extensive Silver Pigeon range. However, where it scores highly in my book is on function and looks.Even though the Italian makers have set about designing a well-balanced clay gun for all-round Sporting use, they’ve dressed it up in a livery that plays down its competition credentials. Thanks to its looks, this particular Silver Pigeon could easily be used on a driven day, and not draw attention from those purists who can spot a dedicated clay shooting gun a field away. The reason they can’t immediately put a finger on its pedigree is purely down to the action frame’s outer appearance – the makers have steered clear of a bright, silver finish and chosen instead to give it a covering of scroll engraving with game scenes on both sides. 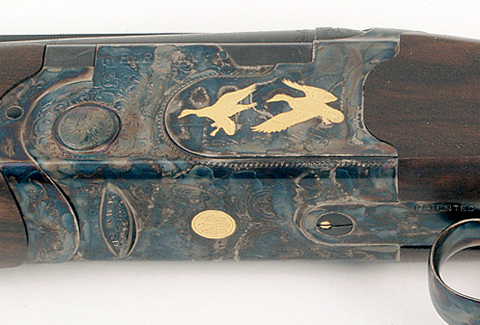 The nicely proportioned birds are highlighted with gold inlay and the Beretta logo appears on the belly of the action in the form of a gold medallion. The whole of the action frame and furniture is then colour hardened. Colour hardening produces a pleasing mixture of mottled blue and grey hues to the metalwork and it’s a process that Beretta has started to use on a growing number of models.This style of finish has not been seen in recent years on mass produced guns, but historically it was the traditional method used by most British gumakers a century or more ago. In fact best makers here still use it on guns made to order. The Beretta Silver Pigeon 5 features some eye-catching engraving. This Silver Pigeon is only available with 30in barrels and 3in (76mm) chambers, that allow it to be used with steel shot, should the need ever arise. As this gun is intended for serious Sporting use, the makers have bored the barrels and chokes on their own Optima system for reduced recoil and better patterning characteristics. Enhanced pattern quality is achieved by using longer than standard flush fiting choke tubes. Even though this gun tips the scales at around 8lb, its weight isn’t immediately obvious thanks to the manner in which it balances; recoil is handled effortlessly and the gun remains stable during firing – two essential attributes when it comes to accurate second barrel use.Another feature of the Silver Pigeon that I’m sure buyers will like is the gently tapered top rib (10mm down to 8mm at the muzzle) which effectively improves pointability and target acquisition. Wood quality is good on this grade and the stock is slightly heavier and deeper than that found on the field version – no bad thing when you find yourself shooting a lot of cartridges over the course of a long day at either a shooting ground, or out in the field. The chequer patterns take the form of rounded panels which are nicely executed and provide a good grip, another nice touch is that Beretta has used the finer traditional diamond chequering normally only found on its higher grade guns. The gun comes with a full set of chokes and a lined ABS case. There is also a second recoil pad supplied with the case to refine the fit if needed. There’s no such thing as an all-round gun but this one comes pretty close – it’s well at home on the Sporting range and won’t look out of place on a driven day. It will take decoyed pigeon easily in its stride and, with the versatility of 3in chambers a bit of wildfowling also comes within its orbit. It’s not the cheapest Sporter around but it looks good, handles beautifully and delivers crisp trigger pulls. Certainly worth a look. Click here for more gun reviews!